The previous trip had spotted whales past the precautionary area 13 miles offshore, so that's where we headed for this trip. An outgoing tide and very little wind made for a beautiful ride out through the shipping lane, where we saw a harbor seal, harbor porpoises, and California sea lions resting on the shipping lane buoys. We spotted the first spout southwest of buoys 1 and 2. As we slowly approached, we found that there were 6-7 humpbacks feeding in the area. Most were feeding by themselves, a few hundred yards away from other whales. One pair surfaced together. The water was 90-100 feet deep, with huge bait balls showing up on our fish finder. We could see the anchovies swarming at the surface as we looked over the side of the boat. We also noticed some jellyfish in the water as well. Whale with sooty shearwater and container ship nearby. The whales didn't do many fluke dives, probably because most of the food was close to the surface and there was no need to expend energy on deep dives. Often there would be long intervals between surfacing. Some shipping activity was happening in the shipping lane about a few miles away. Almost a fluke dive, but not quite! We noticed lots of sooty shearwaters at this spot, as well as gulls, pelicans, and murres. The sighting was reported to Vessel Traffic so the nearby container ships were aware of the presence of the whale. We found the humpbacks in the middle of the shipping lane, near buoys 3/4. There were two humpbacks diving and feeding in 40 feet of water. There was some bird activity near the whales, as well as some shipping activity. We spotted a sooty shearwater. There was significant swell, but no wind. Humpback with distinctive dorsal fin. One whale approached within 100 yards of us. We saw very few fluke dives. We also spotted a mola mola, or sunfish, feeding on a jellyfish. California sea lions were spotted on the shipping lane buoys. One more humpback was spotted near the junction buoy on our way back in. California sea lions on the shipping lane buoys 3 and 4. We also saw a parasitic jaeger harassing a group of elegant terns. All whale sightings were reported to Vessel Traffic. Parasitic jaeger with elegant terns. On my first trip of the day we found whales right under the center span of the Golden Gate Bridge - the same spot as yesterday. In fact, it turned out to be the same humpback whale hunting near the north tower of the bridge. The wind was blowing at an estimated 20 knots with stronger gusts. A strong tide pulled us continuously east. We approached the whale slowly, making sure to give plenty of space as a large container ship passed by us. The whale was feeding in 120 feet of water packed all the way to the bottom with anchovies. We saw several fluke dives within 50 yards of our boat; we floated in neutral the whole time and never ran more than 3 knots when within 200 yards of the whales. We got a great view of the blowhole and tubercles! By the time we headed back out at 6pm, there was a thick fog over the bay. We still had about 200 yards of visibility at best - sometimes it was closer to 50 yards. The winds were 20 knots and we threw some spray as we headed out towards the Golden Gate Bridge. I had a feeling that the whale would be moving out with the tide towards Diablo Cove, so we decided to slowly move up the north side of the Golden Gate Strait. Within a few minutes I had located a spout 150 yards from us, south of Diablo Cove. Humpback fluke in the fog. We watched a few spouts followed by a fluke dive, then we slowly moved to the north side of the strait to avoid a large outbound container ship and a tug pulling a barge. We also sighted a lot of aggressive harbor porpoise activity, including many mothers with calves, and a harbor seal. 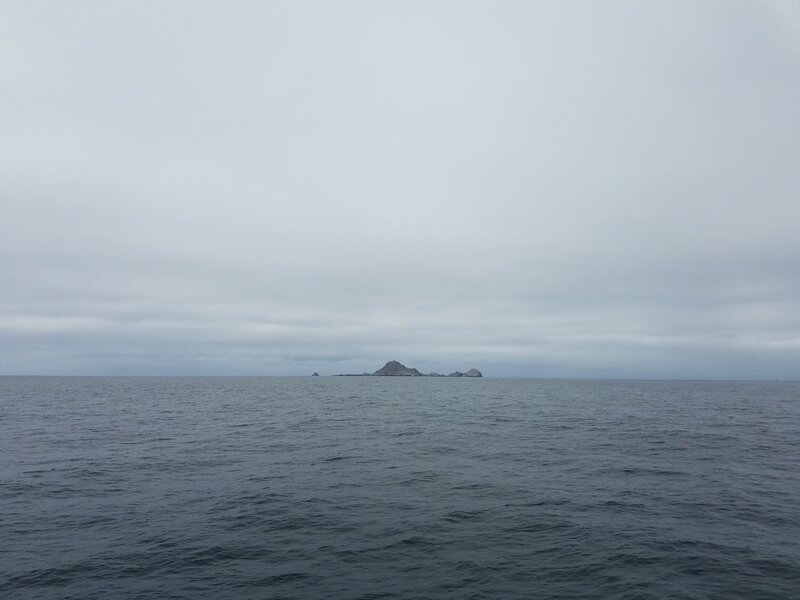 After a few sightings we lost the whale, and we headed back to the middle of the strait. There we found not only our whale, but a massive group of swarming sooty shearwaters. The group was twice the size of the previous day's; the birds did not seem to be feeding. There was lots of other bird activity in the area as well.